By Tony Wade From page A9 | February 20, 2016 SUISUN CITY — You know that feeling you have when you get together with an old friend and even though years have passed since you last saw them, it feels like no time has elapsed at all? That’s what it felt like last weekend when I saw my first production since 2012 by the Vacaville Gaslighters. My bad. They have a new name, Gaslighters Theatrical Company. Since they have moved west down Interstate 80 a bit to perform at the newly reopened Harbor Arts Center in Suisun City, it wouldn’t have made much sense to keep Vacaville in their name. Whatever you call them, the award-winning theater company has consistently made entertaining, engaging and fun cabaret-style theater with their “Cafe Murder” series, melodramas and special events. They needed a bigger space that was compliant with the American with Disabilities Act and hadn’t performed since October 2013’s “Polter-heist.” (I sadly missed that show). While there were numerous new things about the experience – the venue, the name of the company, even the name of frequent actress Annie Muehlenbruch (she got married last year and is now Annie Morris), so much of it felt pleasingly familiar to someone who has had the pleasure of experiencing their fun, engaging whodunnit shows before. There was a buzz of excitement filing into the theater and since space is at a premium, patrons shared tables just as we did in Vacaville. I like that feature because what often happens is you become single-serving friends with your tablemates as you collectively don your detective hats to solve the murder mystery. “Murder on the Oriental Rug” is a play within a play as the actors portray actors who are being duped by the director. It had sight gags, zingers, costume changes, men in drag – so many of the madcap antics that are irresistible to those coming there expecting to be entertained and enjoy some belly laughs. The cast all provided appropriately over-the-top, campy, splendid performances and included the aforementioned Annie Morris as Dakota/Miss Harmoinia Jones, Oz Angst as Ascott St. James/Inspector Herculi Perogi, Marissa Dunlap as Thelma/Emma Ovary, Brian Stevens as Dirk/Dr. Ovary and Dave Fickess as the director. I have seen Morris and Angst in numerous productions including the hilarious 2012 show “Trouble at the Tropicana,” where they nailed the characters of Lucy and Ricky. They, along with their castmates, were fabulous. Morris also directed the show. While there were laughs galore, once the murder happened and we were called upon to question the cast for clues, it was, well, funny how serious some audience members took it. Some fired questions and follow-up questions at them like the White House Press Corps during a presidential scandal or something. The only hiccup in the show was that since the actors were playing actors, the questions needed to be directed to the specific cast member and not the character that the cast member was playing. For example, questions needed to be asked of Stevens’ character Dirk and not Dirk’s character in the play, Dr. Ovary. It was a little confusing for some. I will include myself in that “some” and use that as the excuse as to why I once again picked the wrong person as the killer. My record is intact. I have never gotten it right. 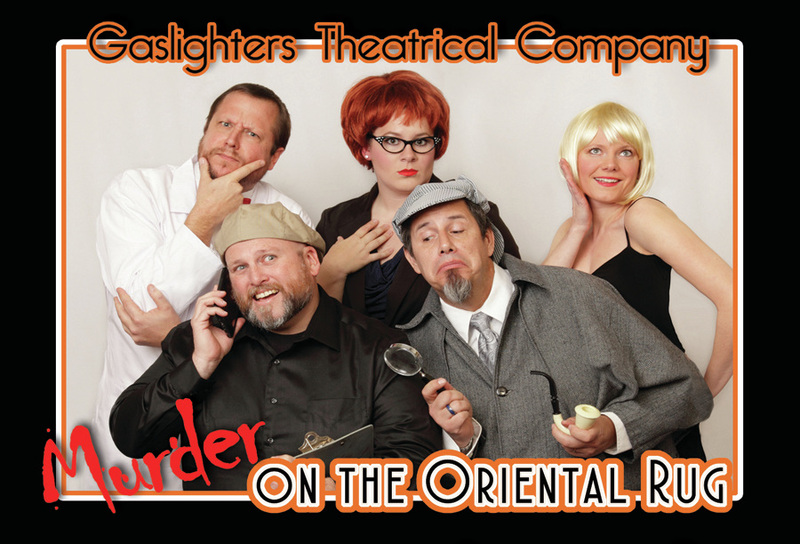 “Murder on the Oriental Rug” is a fun and funny farce. Welcome back, Gaslighters. You were missed. Reach Fairfield writer Tony Wade at toekneeweighed@gmail.com. VACAVILLE — Looking at it from the outside, I suppose it may seem a bit peculiar on a beautiful summer day to go into a darkened room to watch people pretend to be murdered and then try to figure out who did it. Peculiar or not, the Vacaville Gaslighters murder mysteries are a ton of fun and every one I’ve attended has been packed with would-be detectives. 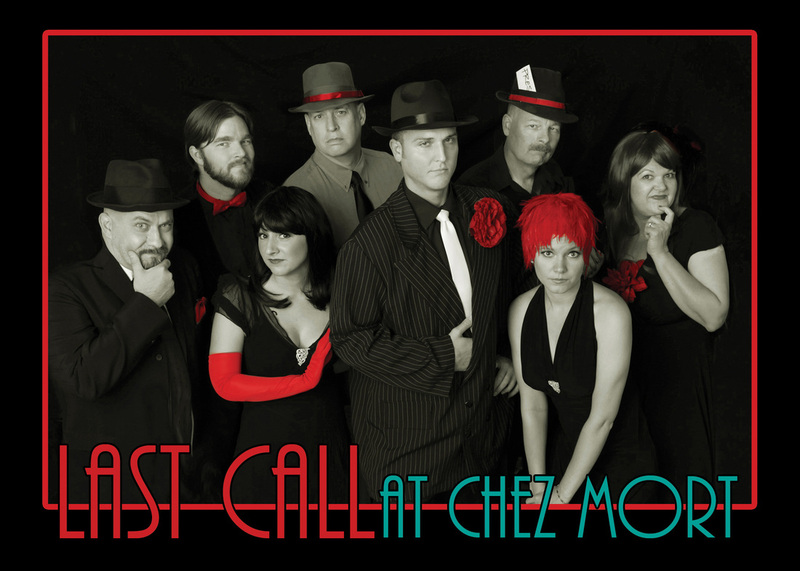 The troupe’s latest production is “Last Call at Chez Mort” and reflects the film noir style of the 1940s. The show features many of the “usual suspects,” as in cast members who have been in numerous Gaslighters shows. Annie Muehlenbruch has shown the ability to play a rather vacuous character accurately and to elicit laughter and not derision or (even worse) pity. She truly nailed the character of Sweet Sue in the current production. With her jarring look — a fluorescent orangish-red feathered wig with matching outfit– and an atonal version of “Let’s Call the Whole Thing Off,” Muehlenbruch was an absolute scream. Cathy Knowles was très funny as the French woman Jean Paulette Truffaut and Travis Nelson was great as thug Big Suit Stu, who was nearly swallowed by his oversized jacket. Tim Dunlap as Mack, a.k.a “Gertrude,” (don’t ask) deftly handled some tricky wordplay and was funny in his dustups with Big Suit Stu. Pat Lemley, as reporter Smitty, and Chuck Strong, as Hans the quiet and menacing bodyguard, rounded out the cast nicely. The role of Inspector Eddy Constantine was played with zest and aplomb by Mick Simpson. I have seen Simpson in a few productions now and he is always a standout. In “Chez Mort” he just flat-out killed it. Simpson was just “on” — nailing difficult tongue-twisting lines as well as throwing in perfectly placed ad-libs, all punctuated with hysterical mugging and leering. The whole shebang was tied together in a delightfully seamless bow by director Kerry Brown. For the uninitiated, the way the murder mysteries work is that during the show a character is done in. After an intermission, the audience can pepper the cast members with questions before recording guesses of who the killer is. The winner gets a prize. I have a streak going at Gaslighters’s murder mysteries: I have never correctly guessed the killer. I really did try my best to pick up on clues, but like a magician who lures your attention away from his sleight of hand with diversions, the humor and ad libs did a number on my concentration. As if I needed any added pressure, the tables had names on them and I was seated at no less than the Sherlock Holmes table. I vowed to do him proud. They announced the time to write down our guesses, the slips of paper were collected, the killer was revealed and we showed our appreciation for an entertaining afternoon. And yes, I was wrong again. Reach Tony Wade at getthelowdown@sbcglobal.net. Ricky, Fred and Ethel, given a wonderful local treatment. Annie Muehlenbruch was a splendid Lucy Bacardi and had the mannerisms of the queen of the sitcom down. Oz Angst was hysterical as her husband Ricky Bacardi with his thick Cuban accent mispronouncing words in English for comedic effect. Real-life husband and wife Paul and Cathy Knowles were perfect as Fred and Ethel Schmertz. Rounding out the cast were Naomi Vergara as Lily B. Meyer/Cookie, Mick Simpson as the gangster Mr. Big, Sam Homich as the detective, Monica Zehm as the waitress and Kelley Collins and Selena Johnson-Brown as the Tropicabana Girls. The show was engrossing and humorous, just like an episode of “I Love Lucy.” Comedy can morph into unfortunate tragedy if not done right, but the show was fast-paced, self-aware and just doggone funny. It definitely wasn’t Shakespeare, but it wasn’t trying to be. At the last Gaslighters show, I brought my teenage daughter and she loved it as much as I did. This time, however, I’m glad I brought my wife. Not because there was anything objectionable, it’s just that while I have shown my daughter the YouTube clip of the classic episode when Lucy and Ethel are scarfing down chocolates on the conveyor belt, she didn’t grow up watching the show. The overwhelmingly Baby Boomer crowd caught every nuance , such as Ethel and Lucy crying in unison and that funny displeased sound that Lucy made and it was all met with wails of appreciative laughter. bubbling up from deep inside summoned by great timing and material. Other cast standouts included Mick Simpson whose menacing, captivating stage presence was tempered by a comical high-pitched laugh. Audience participation makes the show even more intimate and at one pointa conga line started and I was dragged into it. My horrific conga line dancing would be the only thumbs down part of the show. Since it is a whodunit, one of the characters in the cast was murdered and then it was up to the audience to pick who the culprit was and why. After a brief intermission, the detective conducted a question-and-answer session with the audience being able to suspiciously query each member of the cast. One of the funniest questions directed toward Lucy and Ricky was “Do you still sleep in twin beds,” a reference to the popular 1950s practice of not showing married couples occupying the same sleeping space on television. The old-timey atmosphere of the Gaslighters experience with its location on Main Street and the cabaret tables and such adds to the fun. If I can somehow manage to break with my incredible cheapness, I must try it with the dinner. I think the only thing better than having big belly laughs would be having them while filling your belly. If the question of a whodunit wasn’t who killed someone but who consistently delivers an incredible entertaining and interactive evening of cabaret theatre then the correct answer is the Vacaville Gaslighters. By the way, the audience member who guessed correctly at our show was ironically named Lucy. "Love you guys!" --Marissa D.
"Best small performing arts group in Northern California. Wouldn't miss any performances." --Richard G.
"We LOVE all your performances. They are always so much fun. We look forward to your next show. It's the best entertainment in town!" --Linda B. "Great theatre fun!" --Ann F.
"Fantastic fun!! Theatre is alive and well in Vacaville!" --Linda P.
"Enjoy your shows. Shows are fresh and funny and costumes are great." --Carol D.
"Always enjoy coming to shows. Price is good. Nice atmosphere!" "What a great cast! Bravo! Whole evening was delightful!" "Thank you! A great evening of fun!" "Thank you for a great night. Dinner was wonderful and the performance superb! I Loved it. I'll be back." "I had a great time! This is great family fun!" "Great show! (Last Call at Chez Mort)"
"This was fun and well acted" (Last Call)"
"Lots of fun and interesting. Very interactive." "You are all great! More than worth the price of the ticket!!" "It is sooo wonderful to have this cabaret style theatre right here in Vacaville!!" --Sherry H.
"I think your group is one of those hidden jewels. Once you've experienced a performance you want to see and enjoy more. Thanks to all the Gaslighters group for lots of good laughs and the joy of being" --Dorothy J.
missing out on a fun time!"